Is it Possible for Military Spouses to Get PTSD? Posttraumatic stress (PTSD) can develop following any exposure to trauma—including trauma another person experienced. A military spouse may get PTSD after learning about or otherwise being exposed to trauma their partner faced. This is sometimes called vicarious trauma or secondary trauma. How Do Military Spouses Get Traumatized? According to the Diagnostic and Statistical Manual of Mental Disorders (DSM-5), a person doesn’t have to directly experience trauma to develop PTSD. Witnessing someone else’s trauma, learning a loved one was hurt, or repeatedly hearing details about a traumatic event can also cause PTSD. Repeatedly listening to their partner’s traumatic stories. Witnessing gruesome military combat on television, either during or after a partner’s deployment. Feeling unable to escape the trauma their partner continually relives. Some military spouses also develop PTSD due to their own military-related trauma. Depending on the mission, a spouse may not be able to locate or talk to their deployed partner. They may spend months or years terrified about their partner’s well-being. This fear can be compounded by graphic media coverage. 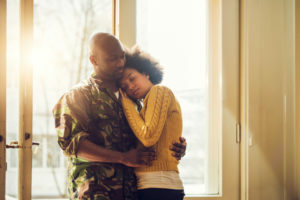 Military spouses who experience symptoms of PTSD should know that military combat is not the only reason people develop posttraumatic stress. PTSD symptoms may be related to another trauma, such as a car accident, sexual assault, or child abuse. 12.9% of wives attributed their symptoms solely to a spouse’s deployment-related trauma. Most wives (62.4%) said their distress was wholly unrelated to a partner’s military service. 24.7% said their distress was due to a combination of their partner’s military service and other factors. For people who have already experienced trauma, exposure to a loved one’s trauma may re-trigger the previous trauma. How Common Is PTSD Among Military Family Members? PTSD is a common experience. According to the National Institutes of Health, about 7.7 million Americans have PTSD at any given time. The 2011 study above found 21.6% of military wives qualified for a PTSD diagnosis. Previous and ongoing trauma: For instance, a sexual assault survivor may be more likely to develop PTSD, or to re-experience trauma, in response to a spouse’s trauma. Support system: A person may become socially isolated as they await the return of their loved one. Someone with little social support and few coping skills may be more likely to struggle. Overall mental health: A person who is already struggling with mental health issues may be more likely to develop PTSD. 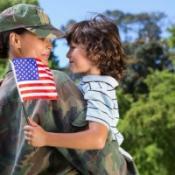 Children can also be affected by a parent’s military experiences. Children who develop secondary trauma may have nightmares, unusual fears, or increased irritability. Trauma can also shift the way children relate to one or both parents. The likelihood of a child developing PTSD depends on their age, gender, and general family functioning. Military spouses who act as caregivers for their loved ones can experience compassion fatigue. Over time, the demands of continually caring for someone can deplete empathy. A spouse might begin feeling resentful instead of compassionate. Compassion fatigue can harm the relationship, and it may lead to worsening symptoms of PTSD in one or both spouses. Trauma is not a contest…Everyone affected by PTSD needs and deserves help.Support from expert caregivers, such as therapists and doctors, can be crucial. Regular breaks from the demands of caregiving can also be important. A person who intends to provide all the care their loved one needs, without any assistance, is much more vulnerable to compassion fatigue. Romantic relationships are an important outlet for many people. Spouses often rely on one another for emotional support, freely venting and seeking empathy. When a partner is struggling with serious mental health symptoms, they may be less able to provide comfort. This change deprives the caregiving partner of an important source of emotional support during a time when they need it most. Therapy can help partners manage the effects of PTSD on a relationship. With the right therapist, military spouses can stop feeling like caregivers and begin feeling like partners again. Therapy can also help the care recipient feel understood and supported. A couple may find the process of navigating trauma together deepens their relationship in the long run. Trauma is not a contest. You might face unique stressors that your partner does not. It doesn’t matter who has it worse or who has suffered more. Everyone affected by PTSD needs and deserves help. Limiting exposure to triggering media, such as war movies or graphic news stories. Taking frequent breaks from caregiving. No one can provide 24/7 care with no support. Schedule time to do things that make you feel good several times a week. Talking to loved ones about your own struggles and trauma. Joining a support group for military spouses. Getting plenty of exercise. Exercise can help with depression, trauma, and anxiety. Military spouses who struggle with secondary PTSD can find much relief in therapy. Therapy helps you understand how your partner’s trauma affects you. It may also help you identify traumatic experiences in your own life that play a role in your PTSD. Therapy can be a supportive place to discuss your feelings without judgment. The right therapist can help you make healthy lifestyle changes and boost your resilience. PTSD isn’t just for soldiers. You don’t have to suffer alone. You can find a therapist who can help you manage secondary trauma here. Is Posttraumatic Stress Negatively Affecting Your Relationships?